After the search of one of the members of the Velilyaev family - a well-known Crimean businessman and philanthropist Resul Velilyaev was taken to the Investigative Committee of the city of Simferopol, the human rights organization Crimean Solidarity informed. Previously, human rights activists reported that as of 16:00 of April 26 the searches of Resul and Ekrem Velilyayev were finished. The Head of the Mejlis of the Crimean Tatar people Refat Chubarov wrote on his Facebook page that the detained Rustem Velilyaev (son of Resul Velilyaev) and Zera Velilyaeva (sister of Resulya Velilyaeva) were released. “The situation is monitored and covered,” he wrote. In turn, journalist Taras Ibragimov on the radio Hayat reported the details of yesterday's searches in Bilohirsk, as well as the court session on the so-called "case of Ukrainian saboteurs." According to him, searches of businessmen in Bilohirsk were carried out under Article 238 of the Criminal Code of the Russian Federation. “This is the storage and sale of goods that do not meet safety requirements. Searches were held under this article. Resul Velilyaev is in the Investigative Committee, where he was taken away by the occupiers," he said. 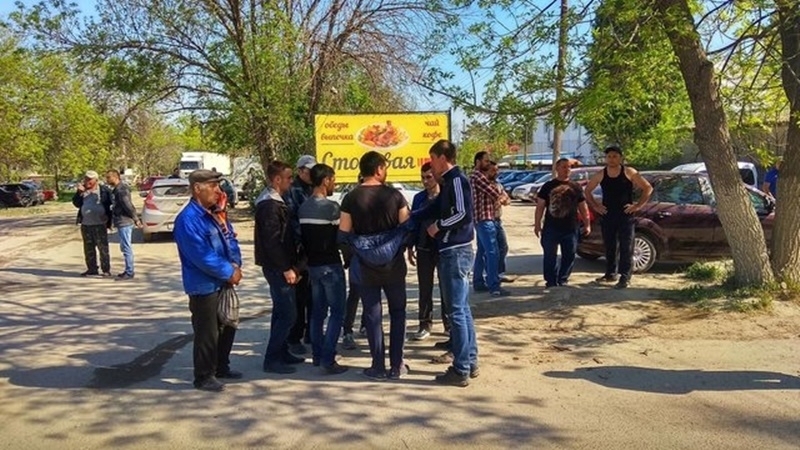 QHA reported that in the occupied Crimea in Bilohirsk, special forces conducted searches in the house of the director of LLC "KrymOpt" Crimean Tatar Ali Bariev and in the network of shops "Guzel". It also became known that the invaders searched not only the house of the director of the company, but the homes of the "KrymOpt" employees as well. The Ministry of Foreign Affairs of Ukraine called searches in Crimea discrimination of the Crimean Tatars. The statement of the Speaker of the ministry Mariana Betsa said that official Kyiv will transfer the evidence of the crimes committed by the Russian Federation to the international courts. According to the Chairman of the Mejlis of the Crimean Tatar people Refat Chubarov, searches in the occupied Crimea in Bilohirsk were conducted by the Russian Federal Security Service (FSB). Security forces in Crimea conducting searches in trading network "Guzel"